Although an integral part of Ganesha Utsav, Fried Modak is a delicacy that can fit into any festive menu. Any time you do a puja or havan for Lord Ganesh, Fried Modak is an apt offering to make. 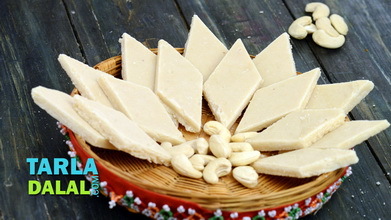 Even those who hesitate to make steamed modak, as it is a bit cumbersome, do not hesitate to make a quick batch of Fried Modak, as it is easier to make. 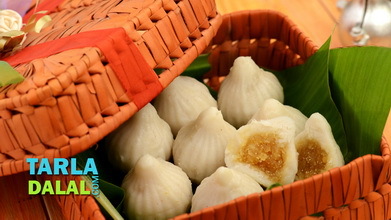 You can’t directly compare the flavours of fried and steamed modak as they are completely different, but kids do tend to like the Fried Modak better as it has a crunchy dimension to it. 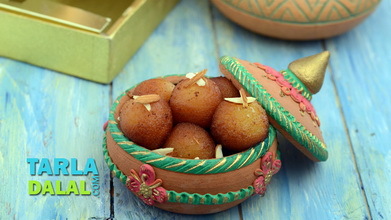 These Fried Modak are made with a dough of whole wheat flour, stuffed with a delicious mixture of coconut, khoya and nuts. 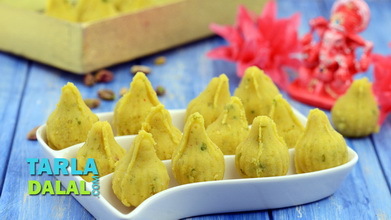 The modak has a rich aroma, brought about by the addition of a few spoons of ghee to the dough. 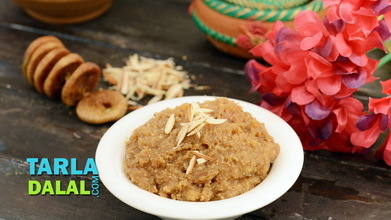 The ghee, along with a little semolina, also gives the outer covering a crispy texture. Although the Fried Modak tastes best when had fresh, you can cool it, store it in an airtight container and use for a day more, if you have any leftovers. 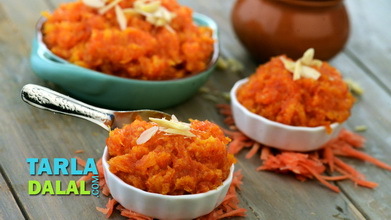 Combine the coconut, sugar and mava in a broad non-stick pan, mix well and cook on a medium flame for 2 to 3 minute or till it turns light brown in colour, while stirring occasionally. 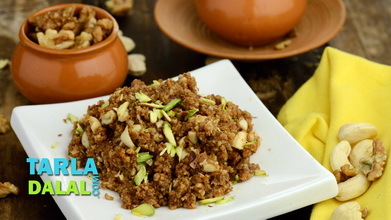 Add the nuts and cardamom powder, mix well and cook on a medium flame for 1 minute, while stirring continuously. Divide the mixture into 11 equal portions. Keep aside to cool completely. 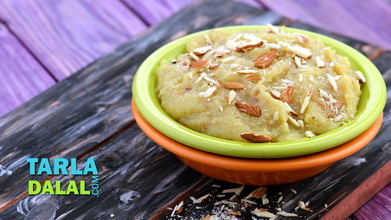 Combine the whole wheat flour and semolina in a deep bowl and mix well. Heat the ghee in a small non-stick pan on a medium flame for 2 minutes or till it is smoky hot. Add it to the flour mixture, add the salt and mix well using a spoon and knead it into a semi-stiff dough using enough water. Divide the dough into 11 equal portions. Roll a portion of a dough into 75 mm. (3") diameter circle, put a portion of the prepared stuffing in the center, pinch it all over the circumference at regular intervals, and bring all the pinched sides together in the center and seal it. Repeat step 6 to make 10 more modaks. 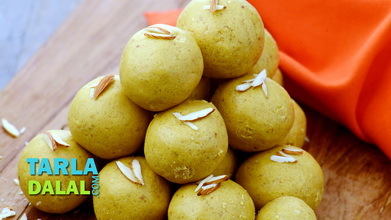 Heat the oil in a deep non–stick pan, deep fry few modaks at a time, till they are golden brown in colour from all the sides. Drain on an absorbent paper.